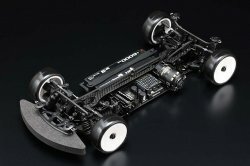 World Champion Yokomo has newly re-designed BD Series. Now available as BD9. Over 90% of parts have been re-designed compared to BD8-2018. Yokomo always follow the new idea and yet again, we are certain Yokomo will be World Champion again over and over. BD9 has been designed thinking highly details including machine ma..
BD9 has been designed thinking highly details including machine material and course environment. No matter the environment or course, designed to perform stable high performance. Yokomo BD9 will be must have item for serious racer who want to WIN! Include Aluminium and Steel Screws for Bulkhead & Upper Deck.